The President Keeper promises to expose “the darkest secret at the heart of Jacob Zuma’s compromised government. The South African author of an explosive book "The President Keeper" that promises to expose “the darkest secret at the heart of Jacob Zuma’s compromised government” has vowed that he is not intimidated by efforts from the country’s state security agency to have the book banned from sale. 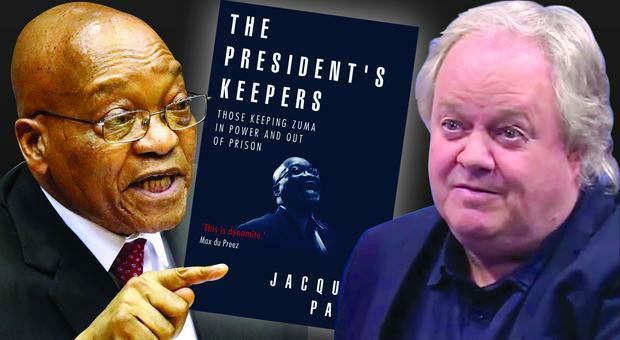 Investigative journalist Jacques Pauw’s The President’s Keepers is a study of what he calls “the people who have brought our country to the brink of a mafia state”. Moving from the Western Cape to Pretoria, Johannesburg and Russia, The President’s Keepers follows “a trail of lies and spies, cronies, cash and kingmakers as Pauw prises open the web of deceit that surrounds the fourth president of the democratic era”, says the publisher. Security Agency (SSA) has beef-up actions dare to silence the latest source of the copyright. The South African authority wants to ban completely "President’s Keepers; those keeping Zuma in power and out of prison", warning the publishers in writing to withdraw the book or face "criminal charges" under the Intelligence Services Act on Tuesday. The South African Revenue Service (Sars) had hinted that it too might go to court to “ban” the book. President Keepers In conversation SABC Digital News with Jacques Pauw Part-1 and Part-2. The controversial Zuma book 'will stay on the shelve Jacques Pauw has a right to stand his ground even the face of pressure over his book on President Jacob Zuma. Rowan Abrahams, So far the publishers have refused. What the book contains is a test, and a challenge, on whether our state institutions have both the capacity and the willingness to deal with malfeasance in our state," the SACP said. President Jacob Zuma who already announced his step down next month December could avoid more serious scandals. Following publication on 29 October, the SSA served NB and Pauw with a cease and desist letter on 1 November, over what it called “unlawful publication of classified information”. The letter said the book was “replete with inaccuracies” and that it “compromise[s] the security of the state”, calling on Pauw and NB to withdraw the book and retract “all those parts which are inaccurate”. Should they “fail to adhere to the above demands”, says the letter, the SSA will take the issue to the high court, and institute criminal charges. The South African Revenue Service (SARS) has also threatened legal action over Pauw’s investigation into Zuma’s tax affairs, blackmailing according to South Africa’s Sunday Times. But NB said that it stands by Pauw, with lawyers acting for the publisher and for Pauw telling the SSA’s lawyers that they will “not desist from making the book available to the public, will not withdraw the book from the market, and will not retract anything therein contained”. Pointing out that the book has been publicly available for more than a week, with thousands of copies already sold, the letter says that there is “no basis for an urgent court application to prevent the further distribution of the book”.Willem De Klerk Attorneys’ letter adds: “Your generalised statement that the book is ‘replete with inaccuracies’ is not backed up by a single reference to any specific statement in the book that is alleged to be inaccurate. Multiple of copies already sold to thousand people so the basis for an urgent prevention and further distribution of the book is futile. Your demand for a retraction ‘of all those parts which are inaccurate’ is therefore incongruous. It is furthermore unclear how you reconcile an allegation of falsity, on the one hand, with an alleged violation of statutory provisions on the other.” A pirated copy of the book has been shared widely on social media, prompting NB to ask readers to buy legal copies of the title. “We understand that many South Africans are doing this innocently, believing it to be a protest against the SSA’s attempt to have the book withdrawn,” said the publisher. “We assure the public the book is not banned and we are printing more to meet the overwhelming demand and working to get them to the shops as soon as possible.” Pauw wrote on Facebook that he had been “inundated with requests from people who want to pay me for the free pdf copies of The President’s Keepers that they downloaded from the internet”, but that he was not going to take their money. “This is not about money. It is about your support that is going to enable us to legally lock horns with SARS and whoever else drag us to court. We face the potential of a multitude of legal challenges, both criminal and civil. If you read the book, you will realize that it is a tried and tested strategy of the state to legally wear out their enemies. This might well be another of those cases,” he wrote. Pauw added that he expected the SSA to approach the high court on Tuesday. “There is no way they are going to be successful. No court is now going to ban this book. If they charge me criminally, we will fight the charges tooth and nail,” he said. Death Threat: “If you don’t stop writing about Jacob Zuma‚ you are going to be dead.” That is the message investigative journalist and author of The President’s Keepers‚ Jacques Pauw‚ says he received from an anonymous caller on Monday evening. “I received a call from a private number while I was speaking to Ronnie Kasrils about his book. The person said: ‘I you don’t stop writing about Jacob Zuma‚ you are going to be dead’‚” Pauw told SABC 2’s Morning Live viewers on Tuesday. Pauw said the threat was the third he has received since his book was published‚ but that he was not “overly” concerned about them. “I suppose it comes with a book like this. There are a lot of unhappy people out there. If someone threatens you‚ they are not going to do it.” He and NB were supported by the International Publishers Association, which called on the SSA and SARS to stop their attempts to have the book withdrawn, describing their efforts “to harass and intimidate Mr Pauw and his publisher [as] reminiscent of the old apartheid regime in South Africa”. “The cruel irony cannot be lost on anyone observing these shameful actions,” said Kristen Einarsson, chair of the IPA’s Freedom to Publish Committee, calling the threatened legal action “crude and ham-fisted attempts at censorship”. Mpuka Radinku, executive director of the Publishers Association of South Africa, said that the moves “could be seen as a betrayal of the vision of a post-apartheid South Africa that the international community had welcomed.